Myanmar is holding its first more-or-less free election in decades, and opposition leader and Nobel Peace Prize winner Nobel Aung San Suu Kyi is on track to be elected president by a landslide. She will be barred from taking office, however, because she had a foreign spouse and children with British citizenship. 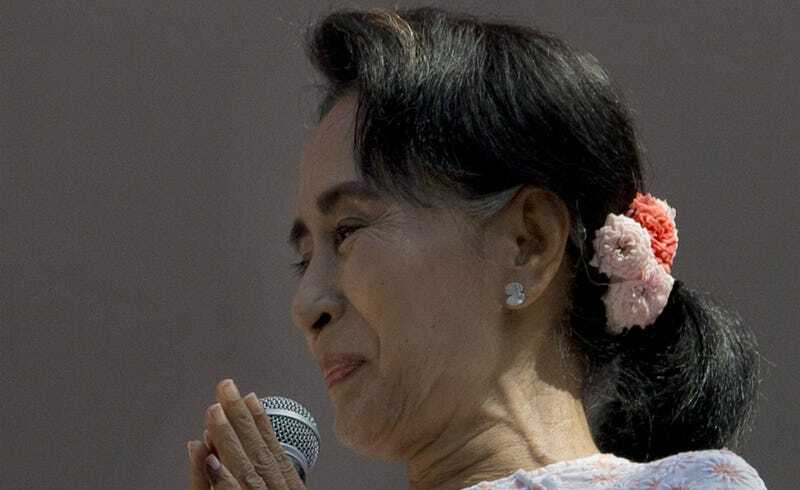 Suu Kyi, an opponent of the current military-backed government, has served 16 years off and on under house arrest. She’s the chairperson of the National League for Democracy, a liberal socialist party she founded in 1988, and which advocates for a true multi-party democracy in the country. It’s been repressed by the government almost since the moment it came into existence. Suu Kyi spent much of the ‘70s and ‘80s in England, where she met and married historian Michael Aris. The couple had two sons. She returned to Myanmar, then called Burma, in 1988 to found the NLD and advocate for democracy. She and her husband saw each other just five times between 1988 and 1995, because the Burmese government refused to grant him a visa. He died of cancer in 1997. Now, Suu Kyi and the NLD are on track to win more than 70% of parliamentary seats in the country. However, unelected military leaders still hold a quarter of parliamentary seats. And because Suu Kyi won’t be allowed to take office, due to her marriage to Aris, the country will have to sort out who will actually become president. It’s still a mess, in other words. Nonetheless, observers are reporting that people are celebrating the election in the streets.